This giveaway is now closed. Thanks to all who entered! The winner is Sharon Lozano. Hope you all had a Happy Thanksgiving! Did you know that Christmas this year will be exactly one month from Thanksgiving Day? Yes indeedy, Christmas is coming! I'm going to make this quick because we're having a busy weekend here and a very busy week coming up, hosting about 20 people for Thanksgiving dinner and all the preparations that come along with such a fun celebration. 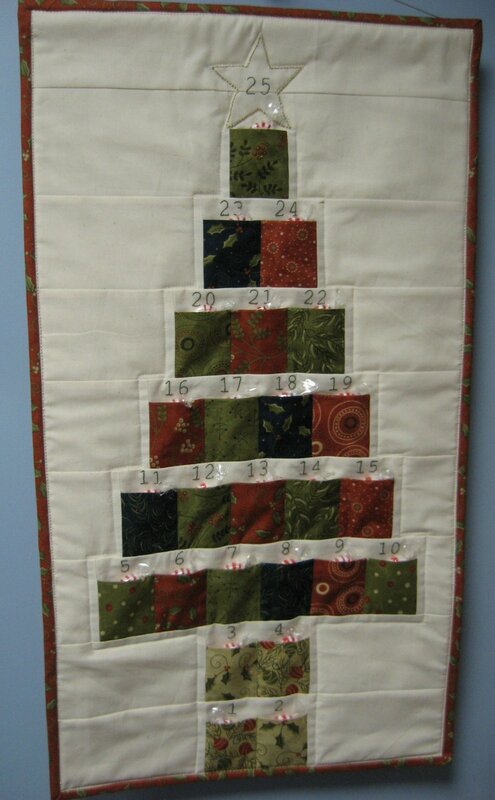 This is my own original design of a Christmas Tree Advent Calendar. The pattern is available over in my Etsy shop so you can make one to help your family count down the days until Christmas, or make several to give as gifts. Just leave a comment on this post before Thursday evening, November 25. Please share with everyone what your plans are for Thanksgiving this year and what you are most thankful for. I'll do the drawing after our company leaves that evening and announce the winner the next day while most of you are out shopping all those great sales! The winner will receive one printed copy of my pattern, complete with pictures and templates for the embroidery. Please make sure I can contact you by email or your entry will not be included in the drawing. That's it! Quick and easy! Now time for some much needed beauty rest! I've been looking for a nice advent calendar to make for my grandson. I'd love to win your pattern. As for Thanksgiving, well we've already had ours in Canada. We had a lovely dinner with all our kids, grandkids, niece and nephew and a family of very close friends. It was lovely. I'm going home for Thanksgiving - four wonderful days. Now I know lots of people go home for this holiday but I haven't been able to in a while. Therefore, this trip is very special to me. We are having a very low key Thanksgiving this year as my two out of state children will come home only for Christmas. So there will just be four of us. I've already finished my grocery shopping! I'm thankful that my Mom is still with us, and that my lovely siblings are all having their own celebrations. Sometimes you jus don't need 20 guests for dinner. Our Thanksgiving will be lively as my son, daughter-in-law and their three little boys will be here for a long weekend. My daughter and her boyfriend will also be here for Turkey Day along with my daughter-in-law's mother and sister. I love making turkey and all the trimmings so I know it will be a wonderful weekend. I would love a chance to win your lovely pattern. Happy Thanksgiving to you and your family. What a lovely advent calendar! Thanks for the chance to win. I will be going to my mom's house to spend Thanksgiving with my out of state family. I am just so thankful that both my parents are still around to enjoy the holidays with. 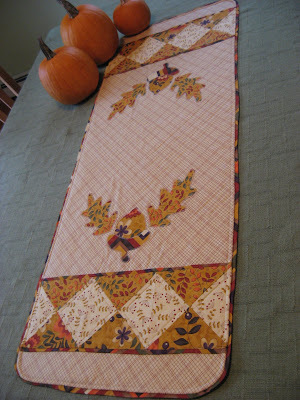 i'll be blogging some nice post for thanksgiving and searching out a Christmas background for the blog... Happy Thxgiving !! it's a creatively GreaT advent tree !